Simple & Easy Vegan Vegetable Pulao in an Instant Pot! 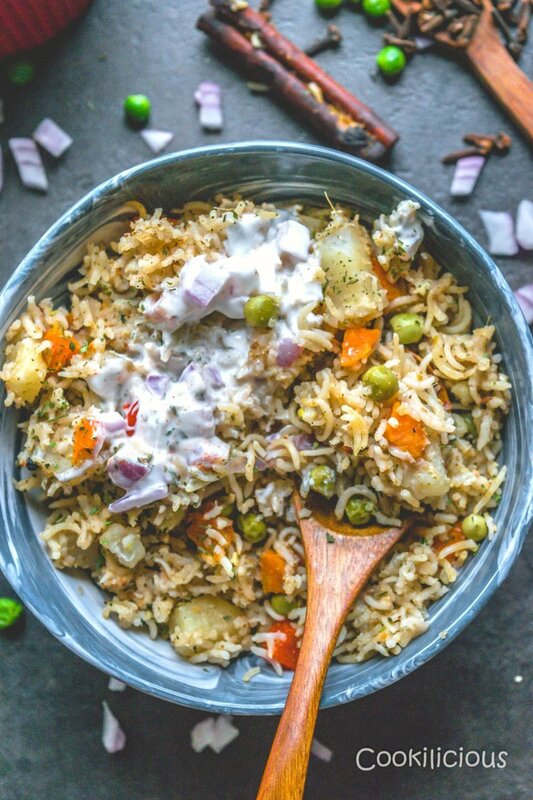 Step by step detailed recipe to make the best Vegetable Pulao in an Instant Pot! It’s an Indian rice preparation for beginners that’s simple, easy and vegan.
. I have been watching them for too long and was tempted to jump the gun and purchase one for myself. Not knowing much about the brands, I went and got a slow cooker from Macy’s only to realize later that its not an InstaPot. Had to return it back. After that episode, I kind of forgot about it. May month was special for many reasons. I had met my year old niece, plus it was my birthday month and we were going to Salt Lake City to attend the Everything Food Conference. Since it was a working birthday this time, we hardly got time to do anything else. Plus KR didn’t get me a birthday gift year and I still keep teasing him about it as it was a first. But overall, May month was good for me and it ended on an even better note! I got an email from Kansas Farm Bureau telling me that I had won an Instapot at a lucky draw at EFC2018! I was jumping with glee when I read that email and profusely thanked them for this on my reply email. I was a tad bit disappointed when I didn’t win anything at the conference but I didn’t know that this was in store for me once I got back. It was not about getting this product for free that was exciting, it was the thought of winning something! KR immediately chimed in that I should consider this as his birthday gift to me which of course I didn’t agree to. I am still awaiting my gift for this year. Anyways, the Instapot arrived and I even did an unwrapping video on my Insta story. Then I began to hunt for beginner recipes that is not very complicated but simple to make. Also I wanted our first Instapot recipe to be something close to our heart. After going through many recipes online, I finally zeroed upon Vegetable Pulao. Since I was an Instapot virgin, I wanted to ensure that I am doing it right and was looking to get as many tips as possible. That is when two of my girlfriends came to my rescue. They both have been using this gadget for more than a year now and constantly share their food pics to tempt me to get one. Both of them gave me insightful tips that helped me prepare this dish without any sweat. While I took down the technique from them, the recipe has my own touch. White Pulao has always been on my list to be featured here and now the timing was just perfect. 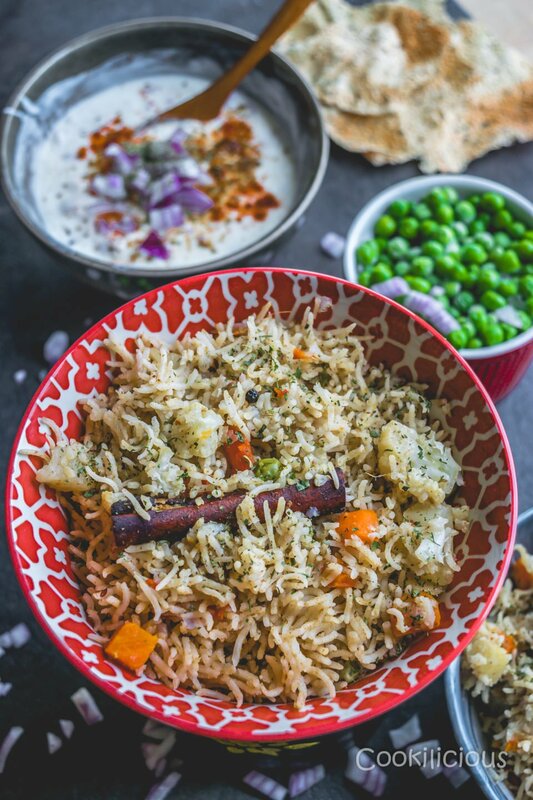 This vegan pulao is loaded with veggies making it a preferred choice for a weekend meal. I must say that preparing this vegetable pulav in an Instapot was super easy. Minimal work and perfect result. 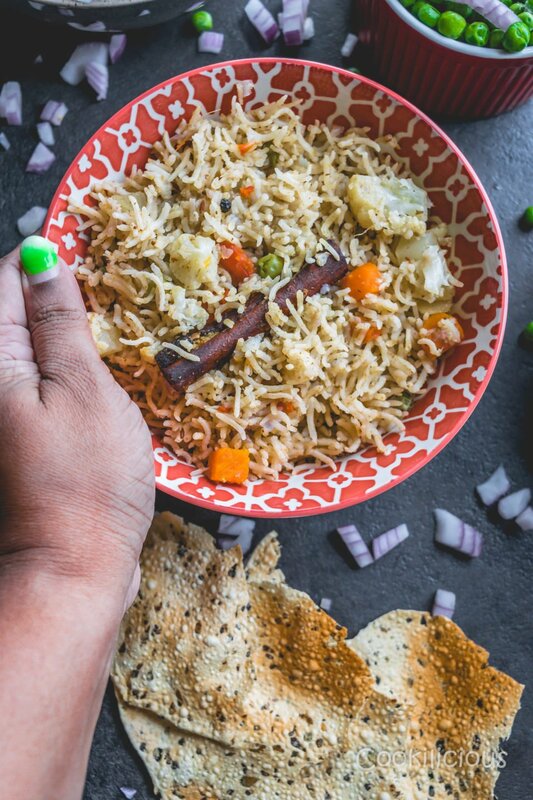 Here is what you need to do in order to prepare this Vegetable Pulao in an Instapot. First chop all the veggies that you plan on adding to this rice dish.
. Fry for 30 more seconds. Then add sliced onions and continue to saute till they turn translucent. Now add the chopped veggies (cauliflower,green beans, carrots, potatoes and green peas) one by one. No need to wait for each vegetable to cook. You can just add them all in together. I would recommend using fresh veggies as much as possible. But you may use frozen veggies as well. Now its time to add the dry masala like coriander cumin powder and garam masala and saute all the veggies for 2-3 minutes. Since this is a white pulao, there is no need to add turmeric powder. Then drain the water from the basmati rice but do not discard that water. Measure the water and ensure that it measures upto 3 cups (if not then add regular water to it to make it 3 cups) and add it to the pot along with the soaked rice. Basically for 2 cups of soaked rice, you need to add 3 cups of water to the pot. Add salt and give it all a mix. But be careful to not break the rice. Press ‘cancel’ button to turn of ‘saute’ mode. Close the lid. Make sure that the sealing ring is placed under the lid and the anti block shield under the lid is placed and pressed in its position correctly. Turn the steam releasing valve on top of the lid to the ‘Sealing’ position. Press the ‘Rice’ button to cook it. It would take around 10-12 minutes. You will hear a beep when the rice is done. Let the pressure release naturally and then open the lid. Note – Do not use the Instapot lid to cover when on ‘saute’ mode. 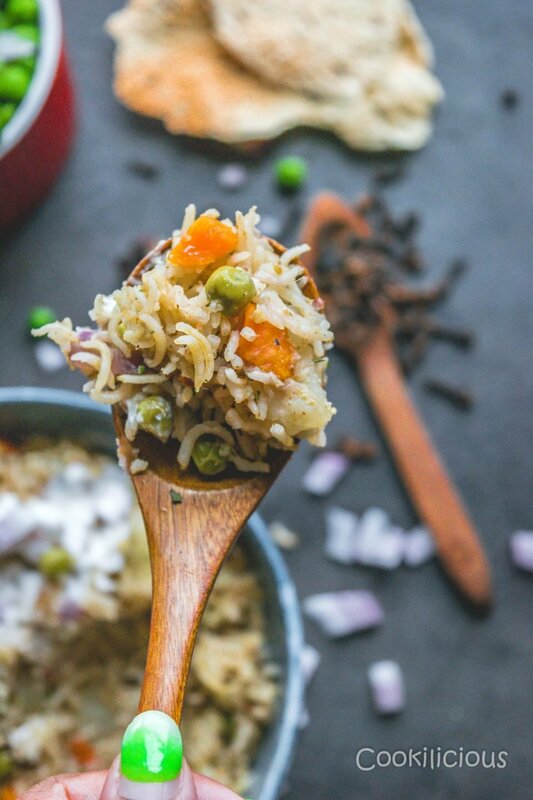 You can use a glass lid if you need to cover.
. Once you make this simple & easy vegan Vegetable Pulao in an Instant Pot, you are never going back to cooktop. If you do try this recipe, please do share it with your friends on Facebook, Twitter and Pinterest. This will keep me motivated to develop more interesting recipes. Click a pic and post it with the hashtag #cookiliciousveg . I would love to see your pictures on Instagram, Facebook and Twitter! 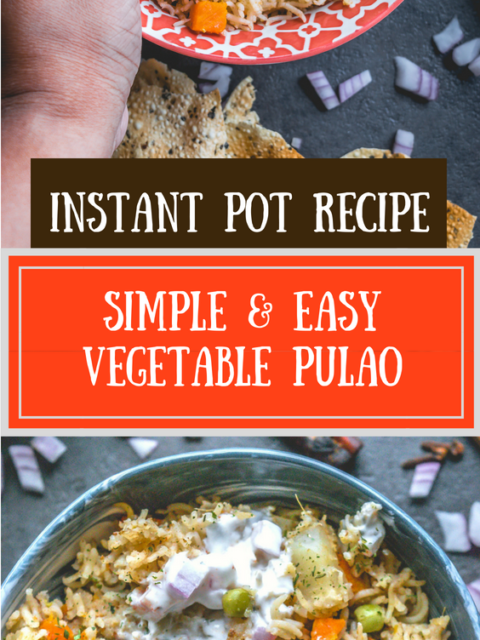 Step by step detailed recipe to make the best Vegetable Pulao in an Instant Pot! It's an Indian rice preparation for beginners that's simple, easy and vegan. 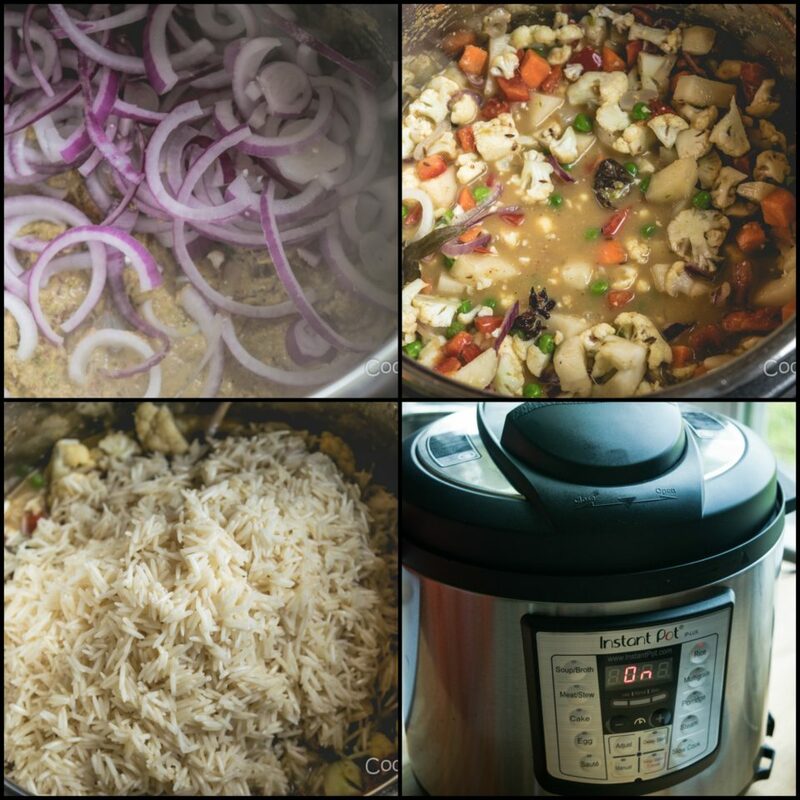 Here is what you need to do in order to prepare this Vegetable Pulao in an Instapot. First chop all the veggies that you plan on adding to this rice dish. Wash and soak basmati rice in water for 30 minutes. Soak mixed nuts (cashews+almonds+pistachios) in water for 10 minutes. Drain the water and transfer the nuts to a blender along with ginger, garlic and green chillies. Blitz to a smooth paste. Keep it aside. Now connect the Instapot to the power outlet. Click the 'saute' button and add oil to the pan. If you are not vegan then you can add ghee instead. Once you know its hot enough, add and temper cumin seeds. Then add the ground paste to the pot and using a wooden spoon, fry the masala for 2 minutes. 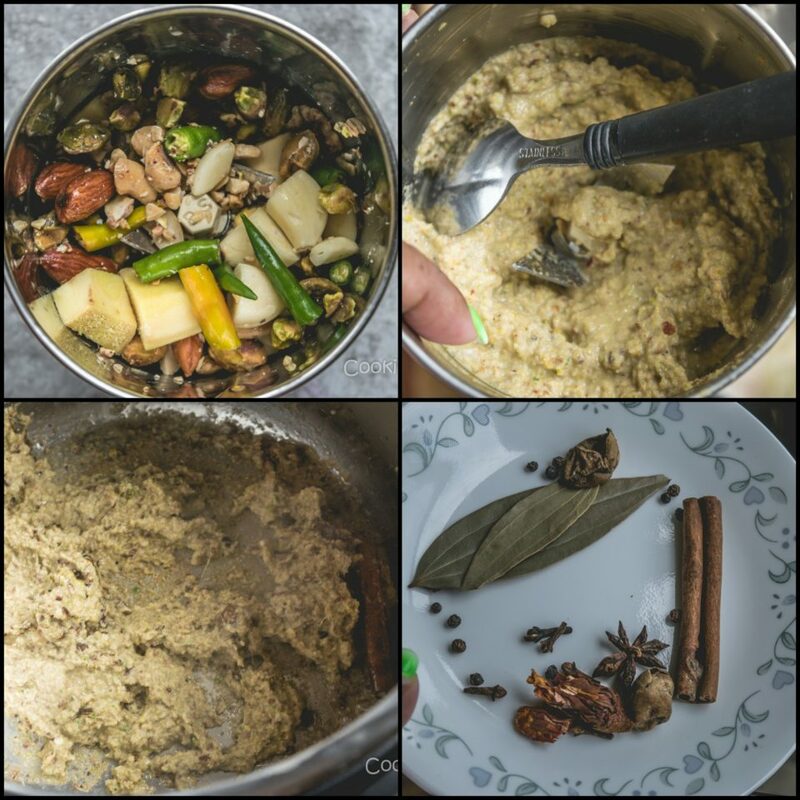 Then add the whole garam masala like peppercorns, cloves, bay leaf, cinnamon and star anise. Fry for 30 more seconds. Then add sliced onions and continue to saute till they turn translucent. Now add the chopped veggies (cauliflower,green beans, carrots, potatoes and green peas) one by one. No need to wait for each vegetable to cook. You can just add them all in together. I would recommend using fresh veggies as much as possible. But you may use frozen veggies as well. Now its time to add the dry masala like coriander cumin powder and garam masala and saute all the veggies for 2-3 minutes. Since this is a white pulao, there is no need to add turmeric powder. Then drain the water from the basmati rice but do not discard that water. Measure the water and ensure that it measures upto 3 cups (if not then add regular water to it to make it 3 cups) and add it to the pot along with the soaked rice. Basically for 2 cups of soaked rice, you need to add 3 cups of water to the pot. Add salt and give it all a mix. But be careful to not break the rice. Press 'cancel' button to turn of 'saute' mode. Close the lid. Make sure that the sealing ring is placed under the lid and the anti block shield under the lid is placed and pressed in its position correctly. Turn the steam releasing valve on top of the lid to the ‘Sealing’ position. Press the 'Rice' button to cook it. It would take around 10-12 minutes. You will hear a beep when the rice is done. Let the pressure release naturally and then open the lid. Lightly fluff the rice with a fork and lastly garnish it with chopped cilantro. 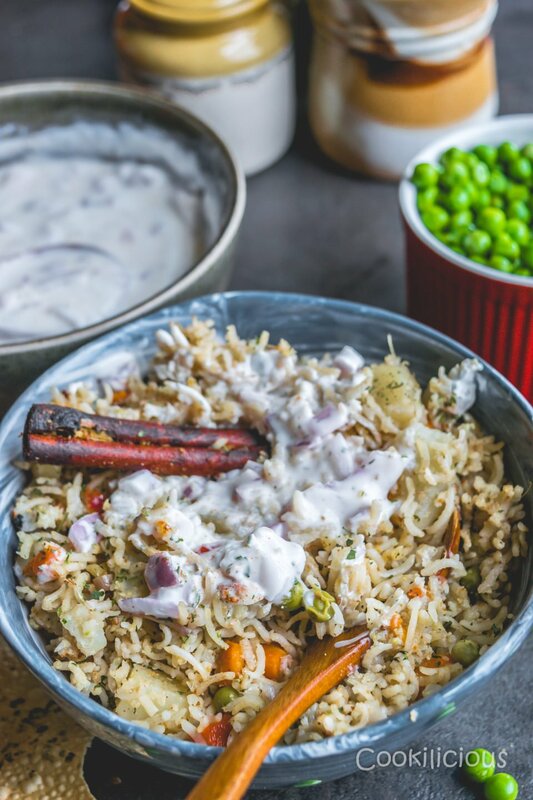 Serve this vegetable pulao with raita, papad and pickle. Note - Do not use the Instapot lid to cover when on 'saute' mode. You can use a glass lid if you need to cover. Now that you know how to prepare this simple & easy vegan Vegetable Pulao in an Instant Pot, I am positive that you also need to prep for the upcoming holidays and need some rice recipe ideas, then do check these out – Vegan Tomato Basil Rice Recipe, Burnt Garlic Fried Rice, Mint & Pistachio Vegetable Rice, Vegan South Indian Lemon & Chickpea Rice, Vegan Pistachios & Dill flavored Turmeric Brown Rice, Roasted Peanut Rice, Soya Methi Pulav | Soy Fenugreek Rice, Lahsuni Palak Rice | Spinach & Garlic Rice, Lebanese Rice With Vermicelli, South Indian Style Tomato Rice and Eggplant Fried Rice | Vangi Bhaat | Brinjal Rice. I used to manage a health food store deli back in college, and we made a vegetarian Pulao on a regular basis. Customers loved it and so did I! I still have the recipe and I definitely need to check yours out! It looks absolutely divine! And hooray for the IP…pinned! I am an instant pot beginner so loving this recipe! I am going to give this one a try it look delicious! Thanks for sharing this recipe. It’s nice to get more vegan recipes for the Instant Pot! This is such a delicious recipe! I don’t make mine quite this way, but I can’t wait to try it next weekend!